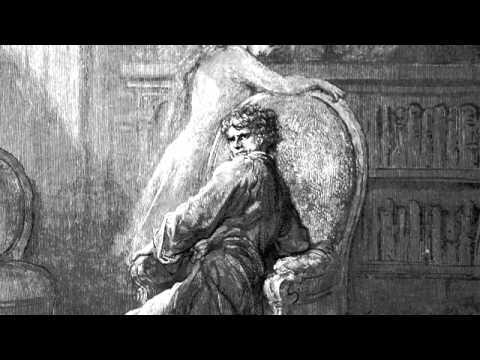 If Edgar Allan Poe had been a musician, what would “The Raven” sound like? This famous poem is noted for its lingering rhythms, sonorous rhymes, and gothic themes. Who better, then, to bring it to musical life than classically trained organist and composer of Halloween Carols™, Kristen Lawrence? Kristen’s setting of all 18 verses follows the feelings of the narrator as he falls progressively deeper into the maelstrom of despair over his lost love, Lenore. Each verse was composed as a musical vignette to illustrate the growing madness as Poe’s character is tormented by the presence of the raven. Kristen’s pure soprano sings the narrative, as if sung by the ghost of Lenore. Like Poe, Kristen has written her own “Philosophy of Composition,” so to speak, with her essay, “A Musical Setting of Edgar Allan Poe’s ‘The Raven,’” which details how she crafted her composition, verse by verse – available as a PDF download. To help explain the genius of Poe’s poem, other PDF downloads are also available in the Teacher Ideas. These may be used in the classroom in conjunction with Kristen’s music to help meet educational standards and requirements. It is in Music, perhaps, that the soul most nearly attains the great end for which, when inspired by the Poetic Sentiment, it struggles — the creation of supernal Beauty. It may be, indeed, that here this sublime end is, now and then, attained in fact. We are often made to feel, with a shivering delight, that from an earthly harp are stricken notes which cannot have been unfamiliar to the angels. And thus there can be little doubt that in the union of Poetry with Music in its popular sense, we shall find the widest field for the Poetic development. The old Bards and Minnesingers had advantages which we do not possess — and Thomas Moore, singing his own songs, was, in the most legitimate manner, perfecting them as poems. Kristen hopes you find “Poetic development” and “supernal Beauty” in her musical offering to Poe. Kristen arranged and recorded two versions of this widely loved song on her first CD, “Arachnitect” – “Bare Bones Version” for majestic pipe organ and “Dead Composers Version” which adds strings to the bellowing cathedral organ. She re-releases the first version on this CD, which showcases the additional four verses she wrote, inspired by the traditional first verse. At the request of teachers and haunters, Kristen now releases both versions as instrumental tracks. Haunters can use these songs as background music for their haunted houses. And teachers can use these tracks as accompaniment for budding young musicians as they make up their own verses to describe poor John’s ghostly skeleton. Look in the Teacher Ideas section to download Halloween Project Ideas. PDF Download: A Musical Setting of Edgar Allan Poe's "The Raven"
Setting Edgar Allan Poe’s “The Raven” to music was a tantalizing undertaking, a project that I approached at times methodically, at times emotionally. Here, in my explanation, I will share how I crafted my composition, what I embedded in it. For pleasure reading or academic reading, take what you wish from my words here. I have divided my explanation in sections so you, dear reader, can easily skip to what topic most interests you. There is much more to the music than I can express with words, so I can’t cover every nuance in this explanation, but here is a fundamental introduction. On All Souls’ Day, November 2, 2010, I sat in my room working on arranging more of my Halloween Carols for my next CD. A creative slump had plopped itself on top of my ideas, so I decided to clean up and organize the mess around my piano to freshen my brain. I looked inside a folder and found a few copies of Edgar Allan Poe’s “The Raven” that I had highlighted for a reading at my Halloween party a couple years prior. I had completely forgotten about them. At that moment, it felt like something in the air changed. I stared at the words of the poem and sat back down on my piano bench in a trance. My hands went straight to an E minor chord, then a B minor chord, then again to an E minor and so on as I sang and played the first line. The music came out so smoothly, I would have been surprised, but it all felt too natural to be surprised. The music continued to come. Not 40 minutes passed and I had the complete melody and chords for the verse (the same melody to be used for each verse). It felt like I had been “haunted” or “visited.” And I was in love with my new little melody. It seemed like a gift presented to me from not-my-head and not-my-room. This melody continued to haunt me over the next days and weeks as I pondered over what to do with it, exactly. Poe’s poem is 18 verses long. And each verse is moderately sizable. I was looking at a 20-minute song. That’s not normal in the popular music world. But it’s plenty normal in the classical music world. And I have one foot in each world, so I decided to simply let my artistic tendencies guide the way. I asked myself whether to through-compose it – alter the melody and accompaniment as the piece progresses with no fixed structure, as many art songs are set – or use more of a ballad/strophic setting in which the melody repeats with more-or-less repeated accompaniment. This choice was like two tasty cookies in either hand, so I decided to take a bite out of each and chew them together. That pleasure which is at once the most pure, the most elevating, and the most intense, is derived, I maintain, from the contemplation of the Beautiful. In the contemplation of Beauty we alone find it possible to attain that pleasurable elevation, or excitement, of the soul, which we recognise as the Poetic Sentiment, and which is so easily distinguished from Truth, which is the satisfaction of the Reason, or from Passion, which is the excitement of the heart. I make Beauty, therefore — using the word as inclusive of the sublime — I make Beauty the province of the poem, simply because it is an obvious rule of Art that effects should be made to spring as directly as possible from their causes: — no one as yet having been weak enough to deny that the peculiar elevation in question is at least most readily attainable in the poem. It by no means follows, however, that the incitements of Passion, or the precepts of Duty, or even the lessons of Truth, may not be introduced into a poem, and with advantage; for they may subserve, incidentally, in various ways, the general purposes of the work: — but the true artist will always contrive to tone them down in proper subjection to that Beauty which is the atmosphere and the real essence of the poem. Along with simply letting this pretty melody be its pretty self and echo through all 18 verses, I also wanted to make my setting educational – to help people memorize this poem, to emphasize its tight poetic rhythms, to ring out Poe’s rhymes… things that a repeating melody can do. But rather than repeat the same chords on each verse, I decided to alter the chords and accompaniment as the story progresses to paint several aurally descriptive vignettes. I see my setting as sort of a “vocal ostinato”: the melody repeats on each verse, but the harmonic settings change throughout. I chose certain chords to imply certain meanings or feelings. I moved notes in certain lines to convey moods. And as I am a woman, and the narrator of “The Raven” a man, I decided to approach my setting of the poem through the eyes of Lenore. The words and thoughts are still his, but I am making her ghost present through my inclinations as a female composer. I sing the work in my recording, but I have had in mind how enchanting – and appropriate – it would be for a man to perform it live, an octave lower. I decided to incorporate a light use of musical themes throughout my setting: a theme for the raven, for Lenore, a heartbeat theme, and a longing theme. My next thought concerned the choice of an impression, or effect, to be conveyed: and here I may as well observe that throughout the construction, I kept steadily in view the design of rendering the work universally appreciable. I should be carried too far out of my immediate topic were I to demonstrate a point upon which I have repeatedly insisted, and which, with the poetical, stands not in the slightest need of demonstration- the point, I mean, that Beauty is the sole legitimate province of the poem. A few words, however, in elucidation of my real meaning, which some of my friends have evinced a disposition to misrepresent. That pleasure which is at once the most intense, the most elevating, and the most pure is, I believe, found in the contemplation of the beautiful. When, indeed, men speak of Beauty, they mean, precisely, not a quality, as is supposed, but an effect- they refer, in short, just to that intense and pure elevation of soul- not of intellect, or of heart- upon which I have commented, and which is experienced in consequence of contemplating the "beautiful." Now I designate Beauty as the province of the poem, merely because it is an obvious rule of Art that effects should be made to spring from direct causes- that objects should be attained through means best adapted for their attainment- no one as yet having been weak enough to deny that the peculiar elevation alluded to is most readily attained in the poem. Now the object Truth, or the satisfaction of the intellect, and the object Passion, or the excitement of the heart, are, although attainable to a certain extent in poetry, far more readily attainable in prose. Truth, in fact, demands a precision, and Passion, a homeliness (the truly passionate will comprehend me), which are absolutely antagonistic to that Beauty which, I maintain, is the excitement or pleasurable elevation of the soul. It by no means follows, from anything here said, that passion, or even truth, may not be introduced, and even profitably introduced, into a poem for they may serve in elucidation, or aid the general effect, as do discords in music, by contrast- but the true artist will always contrive, first, to tone them into proper subservience to the predominant aim, and, secondly, to enveil them, as far as possible, in that Beauty which is the atmosphere and the essence of the poem. Regarding, then, Beauty as my province, my next question referred to the tone of its highest manifestation- and all experience has shown that this tone is one of sadness. Beauty of whatever kind in its supreme development invariably excites the sensitive soul to tears. Melancholy is thus the most legitimate of all the poetical tones. You’ll hear the Lenore theme return at the end of the second verse at 2:00, and weave in several times throughout the piece. Of all melancholy topics, what, according to the universal understanding of mankind, is the most melancholy?” Death – was the obvious reply. “And when,” I said, “is this most melancholy of topics most poetical?” From what I have already explained at some length, the answer, here also, is obvious – “When it most closely allies itself to Beauty: the death, then, of a beautiful woman is, unquestionably, the most poetical topic in the world – and equally is it beyond doubt that the lips best suited for such topic are those of a bereaved lover. I saw that I could make the first query propounded by the lover – the first query to which the Raven should reply “Nevermore” – that I could make this first query a commonplace one – the second less so – the third still less, and so on – until at length the lover, startled from his original nonchalance by the melancholy character of the word itself – by its frequent repetition – and by a consideration of the ominous reputation of the fowl that uttered it – is at length excited to superstition, and wildly propounds queries of a far different character – queries whose solution he has passionately at heart – propounds them half in superstition and half in that species of despair which delights in self-torture – propounds them not altogether because he believes in the prophetic or demoniac character of the bird (which, reason assures him, is merely repeating a lesson learned by rote) but because he experiences a frenzied pleasure in so modeling his questions as to receive from the expected “Nevermore” the most delicious because the most intolerable of sorrow. Perceiving the opportunity thus afforded me – or, more strictly, thus forced upon me in the progress of the construction – I first established in mind the climax, or concluding query – that query to which “Nevermore” should be in the last place an answer – that in reply to which this word “Nevermore” should involve the utmost conceivable amount of sorrow and despair. For the raven theme, I was stumped for a bit. It weighed on my creative powers as such a major thing – the title of this world-renowned, massively popular poem that has seeped into nearly every corner of society. What to do for a theme? It will be observed the words, “from out my heart,” involve the first metaphorical expression in the poem. They, with the answer, “Nevermore,” dispose the mind to seek a moral in all that has been previously narrated. The reader begins now to regard the Raven as emblematical – but it is not until the very last line of the very last stanza, that the intention of making him emblematical of Mournful and Never-ending Remembrance is permitted distinctly to be seen…. …no one point in its composition is referable either to accident or intuition–that the work proceeded step by step, to its completion, with the precision and rigid consequence of a mathematical problem. Verse 1 (0:14) – I start with the basic harmonies in undecorated chords to establish the scene. E minor has been traditionally associated with death, and I’m using it in the same school of thought. Verse 2 (1:09) – I still use the basic harmonies, but I use them with suspensions (a note “out of place” that resolves to the foundational harmony) to connote the sorrow and painful feelings of loss his memories are stirring up. I also use them in this setting to connote darkness, because Poe specifically writes, “it was in the bleak December” – the darkest month of the year. Verse 3 (2:05) – To illustrate “And the silken sad uncertain rustling of each purple curtain”, I thought a “hesitant” descending scale that starts and stops and trades off among the strings could represent that movement. On “Thrilled” and “filled” I use quick up-and-down fifths to emote a sense of excitability. I continue this type of line with “fantastic” being the highest point. In the next line I symbolize his beating heart with offbeat rhythms. This rhythmic theme hints at the upcoming “heartbeat theme” which will enter for the first time after verse 5. “’Tis” is the first time I alter the original harmony. The chord that usually goes in that “slot” is E minor, but here I change it to C to imply the feeling that he’s reassuring himself and thinking relatively positively to calm his anxiety. Verse 4 (3:01) – In the first line, I alter the basic chords that lead up to “stronger” – Em, Bm, C, and then D on “stronger” (see above for the original chords on the first line). C, within the key of E minor, when approached from the five chord (or B major or B minor chord in this key) is called a “deceptive cadence” – the ear thinks it will resolve to “home” (Em, being the “home” key here) but it goes somewhere else. I wrote this to convey his soul growing stronger, moving away from his initial “weak and weary” state. On “and so gently you came rapping,” the strings play pizzicato (plucking instead of bowing) to connote gentle beak action on the window. The pizzicato motif continues in the next line to convey more tapping. I introduce diminished chords for the first time on “you came tapping” to start painting his gradual descent into madness. I wanted that word, with that “sonorous vowel” and “producible consonant,” to echo in the supposed “musical darkness” I tried to create in this verse, so I painted those spots with silence. In the penultimate line, the voice sings its little motif on “echo,” and I echo that a couple times an octave higher in the 1st violin immediately following. Verse 7 (6:26) – This is the verse in which the raven first makes its appearance, so the raven theme comes in during the first two lines. This E pedal point underlines everything – a symbol of how this raven will affect his thoughts. And I use the original harmonies above this low drone, which effect makes a surreal scene. Verse 8 (7:22) – To suggest the word “beguiling” musically, I write somewhat quizzical movements in the strings. And I use a particular chord progression to move to “beguiling” – G7 to F#m (which I also use in verse 12 when “beguiling” appears again). I gave “smiling” the relative major chord (G) coming from a dominant-related major chord (C) instead of the original minor-key cadence (Am, B) to give it a happy-ish feeling. On “grim” I put in an extra personal touch. To explain, I grew up going to Disneyland. And I loved the Haunted Mansion. The theme song of the Haunted Mansion is called “Grim Grinning Ghosts,” and it uses a certain chord throughout the piece – a dominant seventh with a diminished 5. It’s such a peculiar, delightful chord to my ears, so I decided to give a little tip-of-the-hat to Disney and my California homeland by using it whenever the word “grim” appears in this poem. So, in this verse, on the fourth line, the “grim” chord is E7dim5. I continue that line by moving the strings up higher and higher, ending on a fully diminished G seventh chord to convey “wandering from the nightly shore.” On the next two lines, I use a certain combination of chords to evoke a bold, “lordly” feeling – Gm, D, B, Em, C#m, C, A, B, G#m, D, E.
Verse 9 (8:19) – As this is the halfway-through verse, I want to give the listeners’ ears a break from the mostly-E-minor tonality, so I play around in the relative major. Because he says, “Much I marvelled,” I wanted the contrast of the major tonality to portray marveling. However, on “fowl” in the first line, and “bird” in the fourth, I create dissonance with a minor chord and 2-1 suspension in each case to foreshadow that the raven will soon become less a marvel and more an aggravation. Verse 10 (9:33) – As the attention is drawn starkly back to the raven, the raven theme enters again for two lines. Above this E pedal point in the string bass and organ pedals, I write only a cello part that moves up into my voice range where our two lines twist around each other. I continue the Em and Am chords into the final line of this verse, but just as he wallows in his sorrow, and is so sure that the raven will leave him, the bird says his startling “Nevermore,” to which I give an A7 chord, which puts the ear in a quizzical state as I lead directly into the next verse without an interlude. Verse 11 (10:29) – No interlude introduces this verse because I wanted to illustrate the first word, “Startled.” I increase the harmonic rhythm throughout to show his agitation. On the fourth line, “Followed fast and followed faster,” I write the cellos to chase the 2nd violins upward in two parallel scales. In the third line, “Then, upon the velvet sinking,” I fashion a chord progression to illustrate that motion – the bass line and soprano line move down by steps. I use the “grim” chord (as explained in verse 8) in the fifth line – in this case, an E-flat seventh diminished 5 in the first inversion. For the rest of the macabre adjectives, I create an equally “dark” chord progression, full of half-steps, diminished intervals, and so forth. For the final line, I sing the melody an octave lower than usual to suggest the croaking raven. Verse 13 (13:36) – In this verse I return to the original chords to give the ear a foundational “reference” compared to all the wild places I’ve been taking the harmonies. It illustrates that his mind and emotions have been to many places since the beginning of this evening and the appearance of the raven, and now he’s assessing where he is. But just as his attention focuses on the “cushion’s velvet lining” where he is sitting, his thoughts return to Lenore, and so to illustrate the fresh pain coursing through him, I move the top accompaniment line up by half-steps on “She shall press, ah, nevermore!” And the interlude following immediately goes into the heartbeat theme, because no doubt his pulse has increased with this poignant memory. I altered the harmonies in this verse using all sorts of seventh chords to create a hazy, dreamy feel. Verse 15 (15:41) – As this is the verse right before the climax verse, I introduce triplets in a start-and-stop fashion to build intensity. On the word “evil” I use a fully diminished seventh chord (D# diminished seventh), which contains two “devil’s fifths” – a traditional name for a diminished fifth, called “devil’s fifth” because it’s not a perfect fifth. I use another of this chord on “devil” (G# diminished seventh). I increase the linear chromaticism in this verse and the next to illustrate the climaxing of his crazed emotions. Verse 16 (16:36) – Poe, himself, says this is the climax verse, so I unleash the triplets in a continuous fashion to convey the exasperated desperation of the speaker’s wit’s end. To set this verse apart from the other verses, this is the only time I use a B major chord instead of a B minor chord as the second chord in the first line. And this is the only time in the whole piece where I use an F major chord. I use it on “God” and “sainted” to connote his ardent yearning and hoping that he can someday “clasp a rare and radiant maiden, whom the angels name Lenore”. F major is a significant chord in relation to the key of E minor; it’s the Neapolitan chord, which is a chord built on the lowered second scale degree of a key. It departs from the diatonic scale in an aurally astonishing manner, in my opinion. And so, I use it to convey his climactic desperation in attempting to reach for a power higher than the raven – higher than the damning mind game of fate – in the raw craze of his emotions. On “evil” I decided to depart from the more traditional-sounding take on the word (like in the previous verse with the fully diminished seventh chord). Evil is often depicted as scary or ugly or spooky, but I believe it’s a truth that evil often appears beautiful and alluring… with something fundamentally “off” about it. And so, I use an F# chord with a B as its root. Verse 17 (18:36) – As this verse follows the climax, I return to the original harmonies to signify a descent in the verse structure, and to let all the harmonic alterations of the previous verses echo in stinging contrast. The triplets return to duple eighth-note rhythms. I scored the lines to still move with passion, but it’s more of a grudging-acceptance passion than a climbing-madness passion. I incorporate the Lenore theme into the strings during the phrase “Leave my loneliness unbroken!” – the last time the theme plays. Verse 18 (19:34) – For this final verse I use the raven theme throughout with the original harmonies. The E pedal point does not let off once, because I want to illustrate his state of mind, that he’s convinced the raven will always be there, underlining everything in his mind and heart. I answer: To give sadness its place. Why give sadness its place? So I can give happiness its place. We know and measure feelings through opposites and a spectrum of greys. If I want to experience supreme joy in life, there will necessarily be extreme sadness. I believe each emotion must be acknowledged and given its place, thus giving (or striving to give) balance within each of us. How one acts upon each emotion is another matter, and is up to the individual to decide. But emotions are emotions and ought to be approached and sorted through, not ignored or cut off. I have learned through experience to never tell myself, “I shouldn’t feel this way.” I feel what I feel. What I do with those feelings, however, is where my character is forged. And each act, interestingly enough, gradually shapes how I come to feel in the future. “The Raven” captures a season of loss and sadness. It’s a portrait of a moment. Poe’s distraught protagonist might someday heal his sorrows and move on and find new love, but right now his emotions lie splattered and bleeding, and he believes in this moment that he will never recover from this loss, that he will always have this shadow of sadness and suffering over him. It is strange how in my saddest moments I have felt an unearthly beauty about them. I try to let these feelings be what they are, even though my immediate response is to want out of the pain. The most poignant feelings of the human experience, I believe, prime our hearts for experiencing great, great things. Great love. Great joy. Poe has invited us to feel with him. He is giving a place to sorrow, to loss. He has constructed a work of beauty around these feelings, and takes us through a range of moods and scenes with the rhythm of his lilting word combinations. What Poe has done with words, I have endeavored to match with music. ‘Tis the wind, and nothing more." Tell me what thy lordly name is on the Night's Plutonian shore." 15 "Prophet!" said I, "thing of evil!—prophet still, if bird or devil! Is there—is there balm in Gilead?—tell me—tell me I implore!" 16 "Prophet!" said I, "thing of evil—prophet still, if bird or devil! Have you heard of the Ghost of John? Long, white bones and the rest all gone! John belongs in a quaint nightmare. Wobbly jaw and a hollow glare! Wouldn’t things look murky through sockets bare? John is gone from feet to skull. Wouldn’t it be harsh to hug John’s fossil? John’s not sad; he has had his day. Smile that’s fixed in a rigid way! Wouldn’t frowning be hard when lips decay? Empty thoughts top his spine instead. Isn’t it the truth now that he is dead? 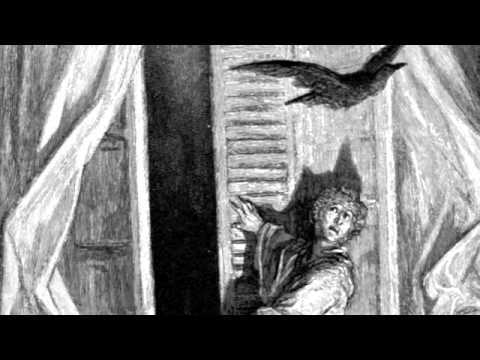 Poem: Edgar Allan Poe's "The Raven"
Lesson: Using Music to Better Understand Poe's "The Raven"